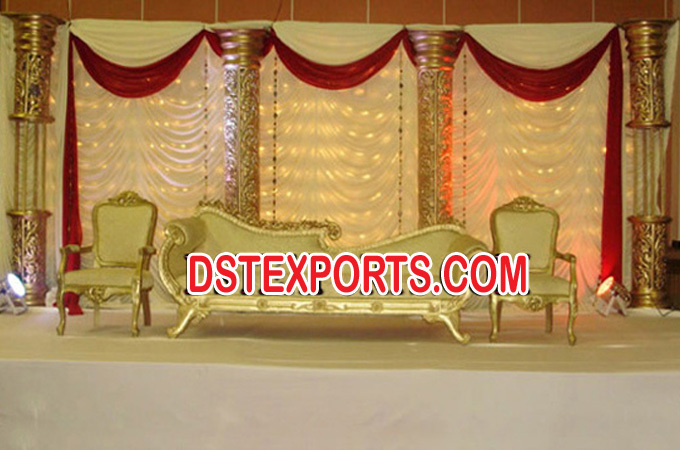 We are manufacturer and exporter of all type wedding furnitures.Indian wedding furnitures Wedding Silver Bride Groom Chairs, asian wedding stage furnitures, hindu wedding mandap furnitures, muslim wedding furnitures,mehandi stage furnitures ,decorated furnitures ,wedding Throne Two Seater Gold Plated Couches Silver carving three Seaters Two Seaters with golden carving Silver Shahi Thrones Royal Silver Chairs Wooden Carved Chairs Maharaja Chairs Love Seat for Bride n Groom Traditional Furniture Wedding Jaimala Chairs This wedding love seat is used for bride and groom sitting purpose on wedding.These furnitures are made of treated wood with hand carving and excellent quality deco painted. We are manufacturer brass metal carved with gold plating furnitures.This wedding Sofa is used for bride and groom sitting purpose on wedding. This is highly carved sofa set which is well cushioned with leather seats.